We carry Acerbis, Clarke and IMS oversize and stock replacement gas tanks for motorcycles and ATVs. We have over 250 gas tanks in stock! 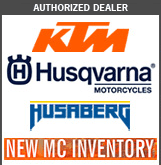 If your dirt bike or ATV is not listed on these pages, please call us for gas tank pricing and availability. Replacement gas tanks are intended for off-highway use and may not meet the emissions requirements for street legal vehicles in your state.